Given the the unenviable task of following Geoff Johns's historic run on Green Lantern, Robert Venditti has penned an interesting, exciting take on the franchise, faithful to what came before but tonally different. (In this, Venditti is Johns to Johns's Mark Waid on Flash.) The design for the Green Lantern Vol. 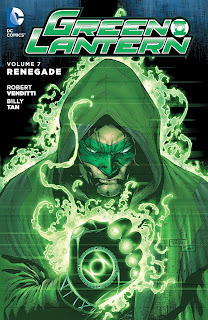 7: Renegade DC You's Hal Jordan is terrible -- all the more so because of the great Billy Tan sketches in the back of this book for what could have been -- but in this unusual chapter of Venditti's Green Lantern saga, he's got another winner. Whether by plan or by fiat, Venditti delivers a quieter Green Lantern story here than he's been able to do so far, with an unusual cast of characters that offer something distinct from what we're used to. Apropos of nothing, renegade Green Lantern Hal Jordan rescues kidnapped nobleman Virgo in this book's first issue and ends up on the run with Virgo and his captor, Trapper, in tow. By and large these are Jordan's companions until this era of Green Lantern ends (plus the smart aleck computer Darlene). It's a surprisingly small cast for the usually expansive Green Lantern title, and in that Jordan handles most of his conflicts alone, one that Venditti seems to intend more thematically than truly plot-specific. Virgo is something of a pacifist, even showing feminine mannerisms, a stark contrast to the swaggering Jordan or even the boisterous Kilowog with whom Jordan usually shares his feelings. There's no lack of male relationships throughout superhero comics on all points of the spectrum, but Jordan's friendship with Virgo feels like something we haven't seen on this title before -- if nothing else, a relationship based on admiration that Jordan develops with someone other than the "work friends" with whom he has to get along. At the point in which Venditti decided to have Jordan break from the Green Lantern Corps (ostensibly to restore the Corps' own reputation), it's hard to say whether the absence of any Corps to chase Jordan around was part of the plan (they've been shunted away via their own miniseries). The result, however, is a story that's suddenly, unexpectedly quiet -- for the first time in probably ten years or more, there's nary another ring-wielder or Lantern hue here (short of Black Hand and some flashbacks). That's very appealing, restoring some of Jordan's specialness and heroism, even if he's not in his traditional uniform the whole time. Venditti pits Jordan against the gargantuan Relic again, and given the multi-title crossover that occurred last time they met, the more insular sequences of Jordan and Relic both fighting and also floating in space talking make for a fine and unexpected sequel. Certainly Venditti goes against expectations to not have this be a story of the Lanterns hunting the "outlaw" Jordan -- a silly ruse anyway that one would hope the Lanterns would be smart enough to see through, so perhaps best that Venditti ducks it. For seven issues including an annual, Venditti's story is tight, the kind of good storytelling that it's unfortunate can't be held up as a Green Lantern jumping-on point because of Jordan's lack of ring and accoutrements. In short order Venditti establishes Jordan's new cast and the mystery of planets turning to stone; Relic provides part of the answer; and then Jordan's off against Black Hand. The story directly spins out of Green Lantern Vol. 6: The Life Equation and the Green Lantern: Godhead crossover right before it, though the DC You trappings obscure a bit that this is all part of the same throughway. Of the seven issues, only one seems perhaps devoted to external pace-keeping, with Jordan as a Fugitive-esque figure defending a small town from zombie Thanagarians for seemingly no apparent reason. Billy Tan does well as usually with clear, energetic art. We also get an issue of Ethan Van Sciver on Green Lantern, always notable, though Van Sciver among others can't do much with Jordan's plain white tunic and inexplicably flowing locks, which Van Sciver takes to the extreme. Pascal Alixe and Martin Coccolo, too, end up with a Jordan almost unrecognizable, either drastically younger or -- in his green hoodie -- unto Link from The Legend of Zelda. Tan's back-matter sketches have Jordan in a techno-getup reminiscent of Pasqual Ferry's Adam Strange, and that -- with some detail to Jordan's costume aside from the trench coat -- would have made a considerably better impression than this. Among Robert Venditti's increasingly long Green Lantern run so far, he's done very little in terms of Hal Jordan being active on Earth, so I'm excited for this book's final tease that sees Jordan planet-side going up against Sonar, if I'm not mistaken. Either way, Green Lantern Vol. 7: Renegade is good, even possibly ground-breaking, and I'm glad Venditti remains on the Green Lantern titles into Rebirth and I'm eager to continue the journey with him.